The larger species include the Atlantic blue marlin, Makaira nigricans, which can reach 5.968 metres (19.58 ft) in length and 818 kilograms (1,800 lb) in weight, and the Black marlin, Makaira indica, which can reach in excess of 5 metres (16 ft) in length and 670 kilograms (1,500 lb) in weight. They are popular sporting fish in tropical areas. Marlin are rarely table fare, appearing mostly in fine restaurants. Most modern sport fishermen release marlin after unhooking. 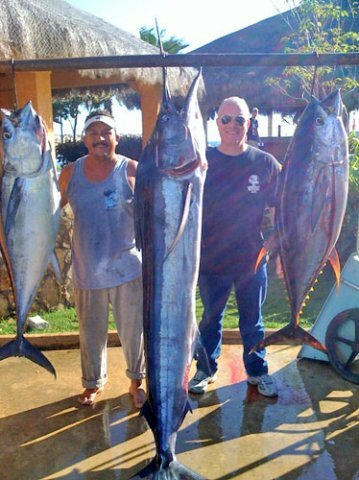 However, the old fisherman in Ernest Hemingway's novella The Old Man and the Sea was described as having caught an 18-foot (5.5 m) marlin to sell its meat.